While most clinicians know there is a lack of effective pharmacological treatment of the underactive bladder (UAB), not many physicians and nurses realize that there is a regulatory approved minimally invasive therapy for UAB. This technique is neuromodulation via sacral nerve stimulation (SNS). The vanguard work of Tanagho and Schmidt in the 1980s led to the development of electrical stimulation of the sacral nerve roots to facilitate urination in cases of UAB or modulation detrusor overactivity in cases of urge incontinence. Neuromodulation offers the advantage of durable, consistent control of lower urinary tract function. This minimally invasive technology requires implantation of the electrode and pulse generator and will be described. In addition to SNS, alternative neuromodulation methods including the Brindley device, bidirectional pudendal nerve stimulation and blockade, the nerve rerouting Xiao procedure, direct electrode stimulation of the detrusor wall, and indirect intravesical catheter-based electrostimulation will be presented in this chapter. 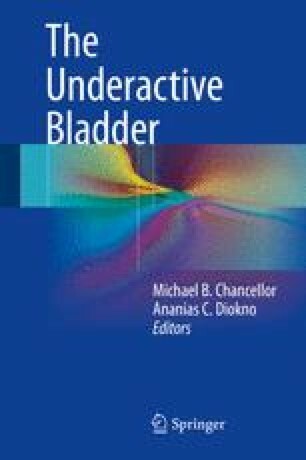 Chapter 9 will present surgical methods to treat underactive bladder.